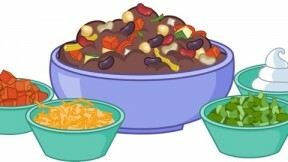 Fizzy’s Tip: Try black turtle, white cannellini, or garbanzo beans, or a combination in place of the kidney beans. The chili can be garnished with chopped fresh cilantro or basil; sour cream or yogurt; sliced scallions; yellow and red bell peppers; chopped black olives; chopped fresh tomatoes; and/or grated cheddar cheese. Heat the oil in a large Dutch oven over medium heat. When hot, add the onions, peppers, zucchini, garlic, cumin, oregano, chili powder, and bay leaves, and cook until tender, 10 to 15 minutes. Add the beans and tomatoes with their liquid, increase the heat to high, and bring to a boil. Decrease the heat to low and cook, partially covered, for 2 hours. Serve immediately, or refrigerate up to 2 days.